Vital 5 Productions has done it again. Earlier this week, they announced the winner of their $500 Arbitrary Art Grant in Sculpture was Jennifer Budke, selected at random from the 96 artists who submitted a photograph of a sculpture made from store items in a shopping cart. 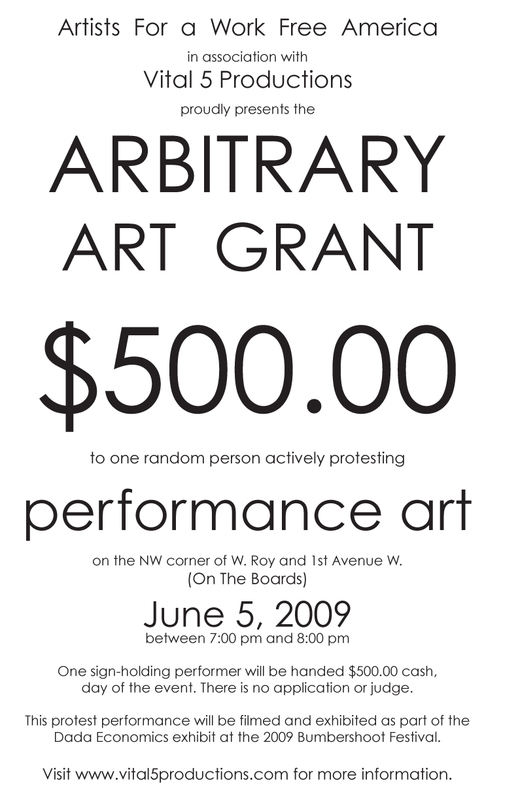 This evening between 7 and 8 p.m., they are going to award a $500 Arbitrary Art Grant in Performance Art to someone actively protesting performance art at On the Boards. Come get your crazy on! Afterwards, there’s an excellent Portable Shrines-curated rock show at The Funhouse featuring Kinski, Eternal Tapestry, and Purple Rhinestone Eagle. I’ll see you there! ~ by emilypothast on June 5, 2009.